Business Loop I-80 and I-80 & U.S. 30 converge at a diamond interchange (Exit 107) in east Rock Springs Photo taken 08/25/14. Business Loop I-80 serves Rock Springs between Exits 102 and 107. The route travels over former U.S. 30 along portions of Dewar Drive, Center Street, Bridger Avenue and Pilot Butte Avenue. Dewar Drive angles southeast from White Mountain Mall and adjacent retail areas to meet both Interstate 80 and Business Loop I-80 at a diamond interchange in west Rock Springs. Photos taken 08/25/14. Business Loop I-80 connects Interstate 80 with Wyoming 430 leading south from Rock Springs. The state highway indirectly connects with the business route via Wyoming 376. Photo taken 08/25/14. Gateway Boulevard leads north to adjacent motorists services, big box retail and a mobile home park. Sunset Drive leads west to additional traveler services to become the south side frontage road for I-80. Photo taken 08/25/14. College Drive stems north from the next traffic light along Business Loop I-80 east to Western Hospital of Sweetwater County and Western Wyoming Community College. Photo taken 08/25/14. Continuing east from College Drive, Business Loop I-80 (Dewar Drive) passes south of a rock outcrop and north of a shopping center. Photo taken 08/25/14. Wyoming 376 loops around the south side of Rock Springs along the Rock Springs Beltway. The 4.3-mile long route links Business Loop I-80 with Wyoming 430 south to Hiawatha, Colorado. Photo taken 08/25/14. Business Loop I-80 (9th Street) turns southward beyond the east end of Wyoming 376 (Rock Springs Beltway) and curves along side the Union Pacific Railroad ahead of Interstate 80. Photos taken 08/25/14. Entering the diamond interchange with Interstate 80 & U.S. 30, Business Loop I-80 ends. The exchange here was originally a trumpet. Photos taken 08/25/14. 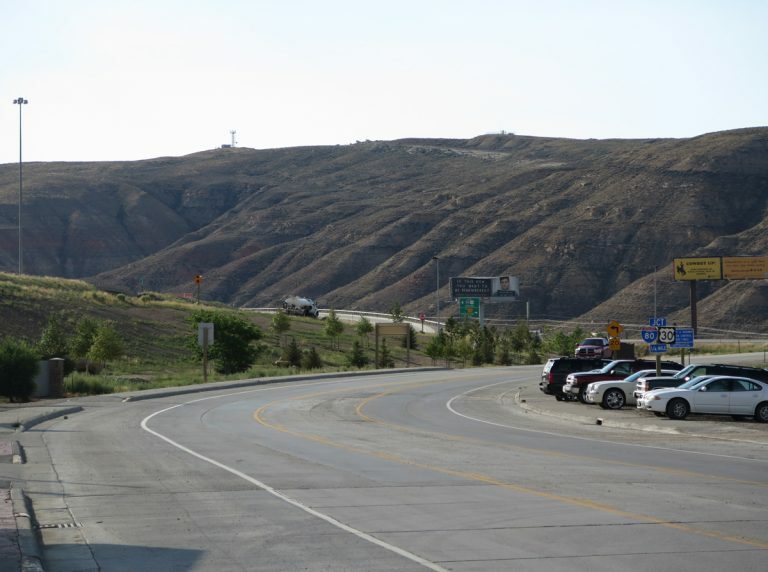 Business Loop I-80 in Rock Springs begins from a diamond interchange with I-80. Initial signs for the route reference only Pilot Butte Avenue and the connection with Wyoming 430 south. Photos taken 08/25/14. The viaduct carrying Wyoming 376 (Rock Springs Beltway) across the adjacent Union Pacific Railroad line comes into view as Business Loop I-80 (9th Street) makes a sharp curve northwest away from I-80. Photo taken 08/25/14. Although wholly routed within the Rock Springs, a city limits sign appears along Business Loop I-80 west on 9th Street. Photo taken 08/25/14. Wyoming 376 forms a 4.3 mile loop south from Business Loop I-80 along the Rock Springs Beltway. The state highway winds around the Rock Springs residential area to intersect Marchant Street east to Wyoming 430 (New Hampshire Street) in two miles. Photo taken 08/25/14. City installed signs erroneously reference Wyoming 430 as U.S. 430. U.S. 430 was historically a short route located in Illinois. Photo taken 08/25/14. North Side Belt Route ties into Business Loop I-80 (9th Street) opposite the east end of Wyoming 376. Photo taken 08/25/14. 9th Street arcs westward from WYO 376 as a three-lane wide arterial through residential areas of east Rock Springs. Photo taken 08/25/14. Business Loop I-80 shifts southwest from 9th Street onto Pilot Butte Avenue at Paulson Street. Photo taken 08/25/14. Reassurance marker for Business Loop I-80 posted after the split with 9th Street. Photo taken 08/25/14. Pilot Butte Avenue leads Business Loop I-80 west across Bitter Creek toward Downtown Rock Springs. Photo taken 08/25/14. Business Loop I-80 (Pilot Butte Avenue) makes an S-curve through the intersection with M Street. Photo taken 08/25/14. Business Loop I-80 transitions from Pilot Butte Avenue onto Bridger Avenue to the immediate west of M Street. This scene looks at Pilot Butte Avenue leading south away from the business route. Photo taken 08/25/14. Reassurance marker for Business Loop I-80 west posted after the transition onto Bridger Avenue. Photo taken 08/25/14. Advancing west along Bridger Avenue, Business Loop I-80 intersects Elk Street. Elk Street is both unsigned U.S. 191 Spur and historic U.S. 187 heading north to I-80. Elk Street south to Downtown Rock Springs was originally a part of Wyoming 430. Photos taken 08/25/14. Business Loop I-80 turns south after Elk Street (U.S. 191 Spur) along Center Street. Photos taken 08/25/14. Grant Street intersects Business Loop I-80 (Center Street) west from A Street (old WYO 430) and east from College Drive. Photo taken 08/25/14. Trailblazers for I-80 take the place of shields for Business Loop I-80 along the remainder of the route west back to the freeway. Photo taken 08/25/14. Business Loop I-80 shifts southwest from Center Street onto Dewar Drive as it spans Bitter Creek for the second time. Photo taken 08/25/14. Continuing south from Smith Street, Business Loop I-80 (Dewar Drive) transitions into a commercial arterial. Photo taken 08/25/14. Wyoming 376 (Rock Springs Beltway) returns to end at Business Loop I-80 (Dewar Drive) from the Blairtown community. Photo taken 08/25/14. College Drive arcs south from a parclo interchange with I-80 to Western Wyoming Community College and Dewar Drive. Photo taken 08/25/14. Business Loop I-80 (Dewar Drive) makes a gradual curve to the northwest toward the commercialized diamond interchange with I-80. Sunset Boulevard north and Gateway Boulevard south come together at a signal from adjacent business areas. Photo taken 08/25/14. The on-ramp for I-80 & U.S. 30 east for Rawlins and U.S. 191 north to Pinedale departs Business Loop I-80 (Dewar Drive) west. Photo taken 08/25/14. The exchange at the west end of Business Loop I-80 was originally a parclo interchange with a loop ramp from I-80 westbound. Photo taken 08/25/14. Dewar Drive extends northwest from the Green River on-ramp to Foothill Boulevard at White Mountain Mall and a subdivision beyond Sweetwater Drive. Photo taken 09/06/05. Second photo taken 08/25/14.